About Dustin Putman and the "Files"
My name is Dustin Putman, and I'm a film critic from the Washington, DC area. I am an alumnus of American University where I majored in Visual Media & Literature. At about the age of 8 or 9, I began rating movies, just for the fun of it. In my teens, I began writing actual reviews for every movie I would see. This hobby became my passion, and my life as an internet film critic took off. In the late 1990s, I was accepted by the Online Film Critics Society (OFCS) as a charter member and, not long after, my first professional website was launched. As my readership grew, I was soon invited to join the Washington Area Film Critics Association (WAFCA) and currently serve among its leadership committee. My website underwent a few design and name changes along the way (including TheMovieBoy.com and DustinPutman.com), finally transforming into the current 3-branched network (TheFilmFile • TheFrightFile • TheBluFile) that you see before you. 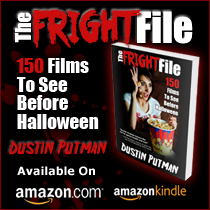 In the fall of 2013, my fascination with the horror genre led me to publish my first book, The Fright File: 150 Films to See Before Halloween. As of January 2015, I have published nearly 3,000 full length reviews and have been quoted in print advertising, magazine articles, on DVD/Blu-ray covers, and in television commercials. Since everyone seems to do it differently these days, I thought I'd give a simple overview of the way I rate movies — using the tried and true 4-star scale. Still, star ratings can mean different things to different critics, so below is a comparison chart for MY star ratings and their rough equivalents to other rating methods with which you're probably familiar. Any movie can be great. Always go into a movie with an open mind, and with no preconceived notions. It's unprofessional to prejudge a film because of the way you might personally feel about an actor or director. It's unfair to assume that a movie of a certain genre can't be any good, or will automatically be good. A terrific trailer can be made from an awful film. An awful trailer can be made from a terrific film. Babies should never be allowed into movie theaters.